Juicing can be a frustrating process. It is true that freshly squeezed juice is a wonderful addition to your everyday diet and can even substitute a regular meal when the correct ingredients are used. With a slow masticating juicer, you can extract the maximum nutrients from your ingredients, packing your juice with lots of flavor, vitamins, enzymes and other nutrients. 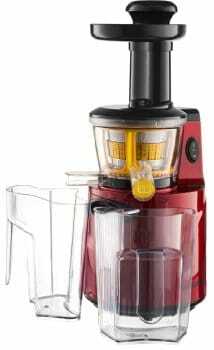 One such masticating juicer is the Gourmia GSJ200 Masticating Slow Juicer. This new juicer allows you to make healthy and nutritious juices from your ingredients by slowly “chewing” on fruits and vegetables to squeeze out the juice without producing heat that destroys the nutrients that are essential to good health. We have reviewed some other more established masticating juicer models too, but they all cost a lot more than this one, so let’s check out if the Gourmia GSJ200 should be considered for more than just its low cost. Designed with practicality and cost in mind, this recently released stainless steel slow masticating juicer succeeds in getting high marks from customers for its excellent performance as much as nutrition and extraction is concerned. Featuring a high quality copper DC motor with a high torque, this versatile, slow masticating juicer allows you to extract juice from different types of fruits, vegetables, and leafy greens thanks to the low revolutions per minute (62 RPM), membrane level extraction, and MasTraction system that enables the equipment to use optimum power. It can even be used to make nut butters! The high torque provided by the powerful motor allows the Gourmia GSJ200 to compensate for the power associated with a low rpm. This gives the Gourmia GSJ200 the capability to speedily and efficiently squeeze out juice from your ingredients without compromising the quality and the nutritional value of your juice. Unlike normal juicers that require you to push the ingredients down with the pusher for maximum juice extraction, the Gourmia GSJ200 does not require you to push the food down. All you have to do is to gently utilize the pusher when ingredients get jammed to allow food passage through the chute for ingredients like leafy greens. You can also save time and effort by not having to perform any precutting, thanks to a bigger feeder so you do not have to cut your ingredients. The unit also comes with a large pulp tank for smooth and efficient juicing without the need to stop the job in the middle to empty out the bin. A filter is also incorporated to aid in foam removal. The Gourmia GSJ200 stainless steel exterior helps decrease the noise level when the equipment is in operation. There is also a large juice jug for collecting juice. Both these containers are easily cleaned, as is the juicer itself, as it comes with a cleaning brush to reach into the spouts and other narrow channels. You can wash all the removable non-electric parts in the dishwasher. It is also important to note that when using multiple ingredients, it is recommended that you alternate between hard and soft foods and leave fibrous foods for the end. For excellent results, get rid of stems and hard fiber from leafy greens before juicing to allow the machine to process the greens with ease and result in a smoother and less bitter juice. Weighing 11.1 pounds, the unit is designed with a broad base that enables it to be easily carried around. Its footprint is smaller than most masticating juicers because it is in a vertical style, unlike traditional horizontal ones. To enable it to steadily stay on the kitchen countertop, the Gourmia GSJ200 is fitted with suction cups at the bottom. Like all other Gourmia products, you are guaranteed a high quality product at a rather low price. While most masticating juicers are priced between $200 and $500, the Gourmia GSJ200 is offered at an amazing price of below $200. For the price, this decent juicer is functional, easy to use, well constructed, durable, and efficient in operation, providing excellent juice quality. With the Gourmia GSJ200, you will have all the independence and the flexibility and freshness in your glass compared to the factory made juice variety because you can mishmash all kinds of fruits, veggies, and leafy greens such as kale (it makes very fine juice with leafy greens), hard ingredients like carrot, and apple and many more. However, you may need to strain the juice if you don’t like any pulp at all. As with all masticating juicers, you have to take your time juicing because with a low rpm comes high quality juice. The unit also comes with a user manual that offers you useful instructions on how to effectively operate and assemble it. In addition, it comes with a one-year warranty from the manufacturer. The Gourmia GSJ200 accommodates fruits, nuts, and greens so it is very versatile. The unit features an exclusive MasTraction system that uses a low rpm for first rate juice and nutrient extraction. All removable non-electric parts are dishwasher safe and the provided brush can reach into any crevice, making it very easy to clean. The sleek stainless steel exterior makes the GSJ200 exquisite in appearance and fits into any kitchen décor. The high torque ensures enough squeezing power for maximum nutrient extraction and reduces wastage. The high quality steel exterior reduces noise. The unit is also very reasonably priced, placing it among the cheapest slow juicers in the market. The safety mechanism prevents the motor from inadvertently turning on and causing injury. It easy to assemble and un-mount. You have to put apart everything for cleaning after using it hence time consuming. Mine broke within 6 mo. of normal use and since it was a gift, Gourmia will not honor the warranty since the claim they need my order number to verify it’s within warranty. (But they offer a 3-year warranty and the item hasn’t even been on the market that long.) They should stand by their brand and give me the replacement part. Heck, I’m not even asking them to replace the unit…just one plastic/metal part!